After yesterday’s bloodbath in the rain, we fast forward a few years and 32 issues later. Catwoman’s life has certainly improved. 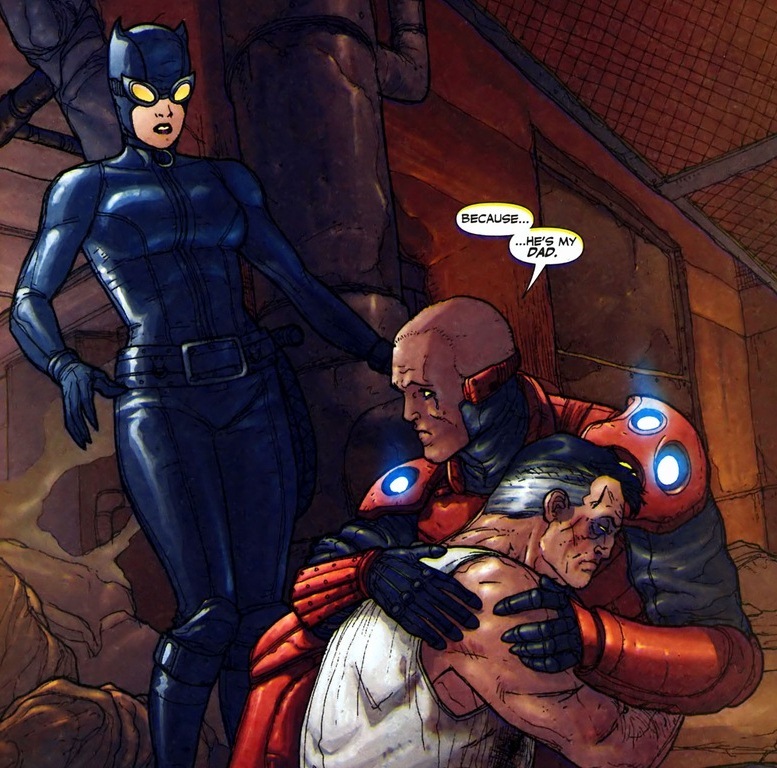 She fought a few muggers, aided the Justice League, explored her and Batman’s relationship, among others. Not a bad time at all. Well, obviously that can’t last – she’s a superhero. 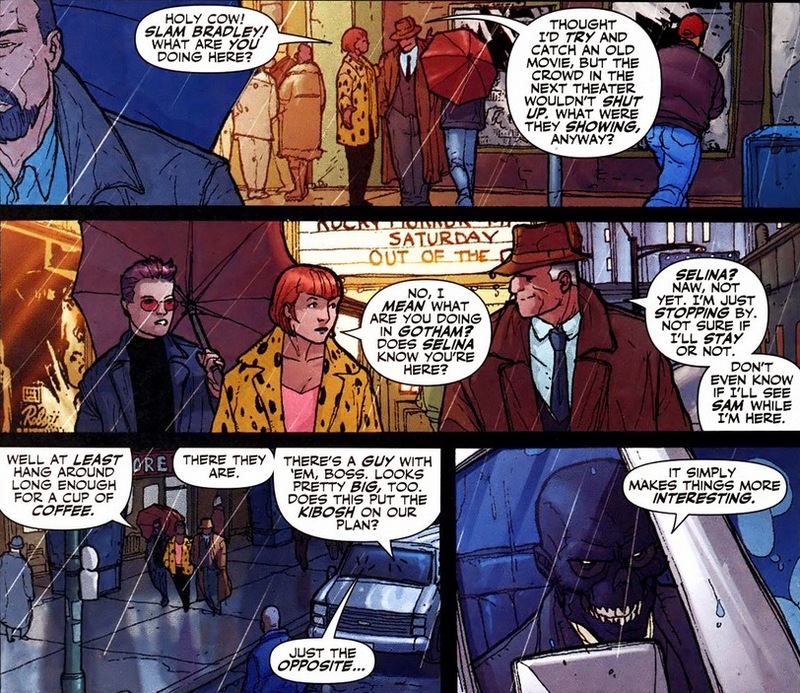 I didn’t mention this before, and that’s my mistake, but the first Catwoman/Black Mask story actually took place before the whole fiasco with the Red Hood that I covered in the first Black Mask article. 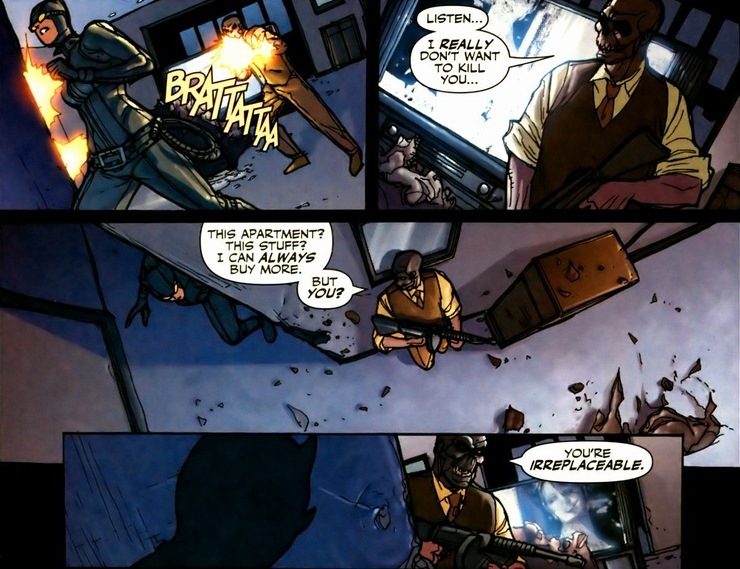 Since then, Black Mask has had his empire toppled and he’s no longer the undisputed king of the Gotham underworld. So how does one fix that problem? Well, I’ll tell you it involves Catwoman. 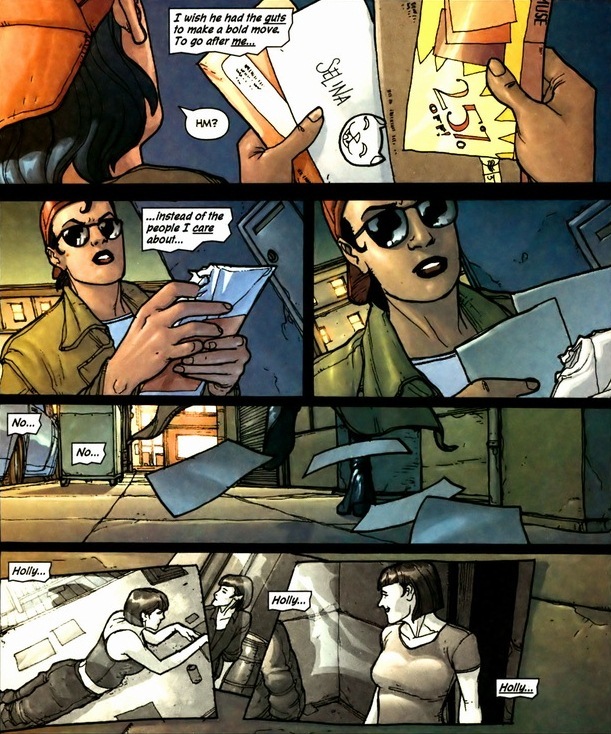 We’ll find out together in Catwoman #48-52, written by Will Pfeifer and drawn by Pete Woods. Yeah, this plan sounds familiar. 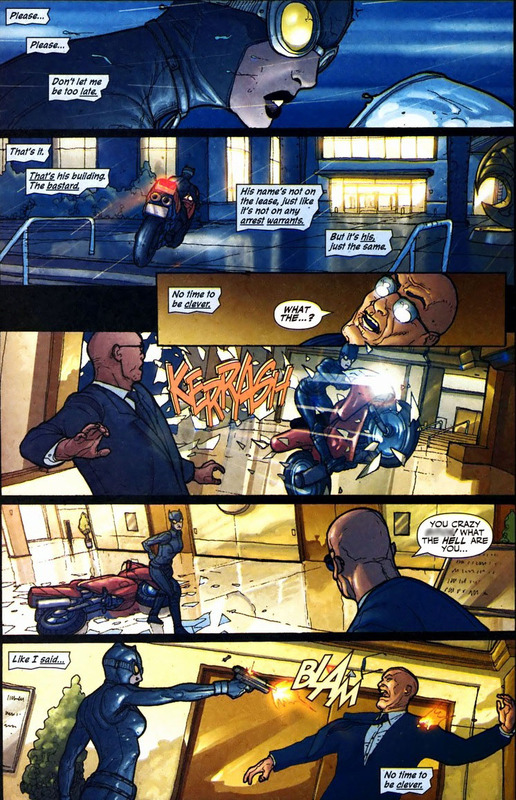 Gotham supervillains are sorta one-trick ponies. 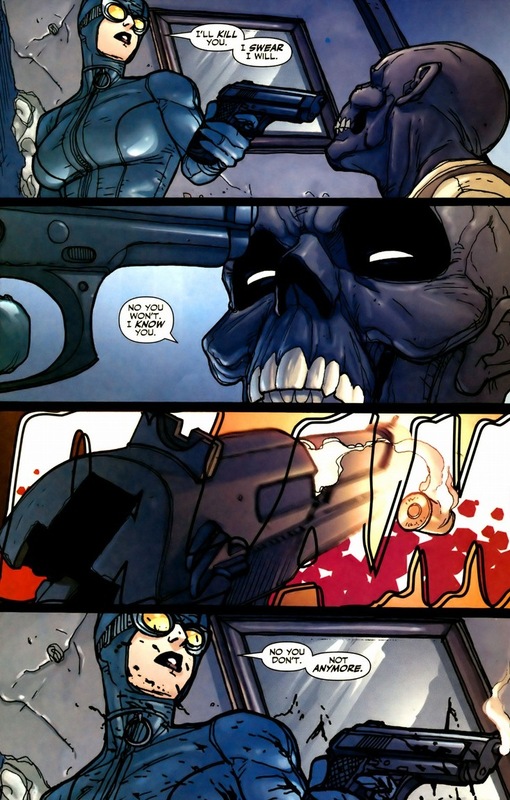 Unfortunately, Black Mask’s trick ain’t juggling. Okay, so apparently a while back, the magician Zatanna and the Justice League secretly cast a spell on Selina to turn her into a superhero instead of a supervillain. 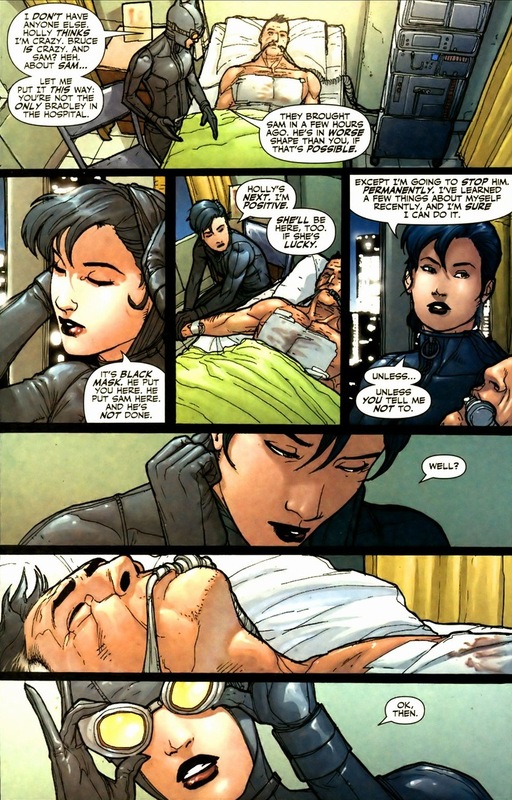 Zatanna decides to tell Selina. It’s a weird subplot and while fantastic for pent up Catwoman angst, magic tends to confuse me and we’re not going to cover it. But if you want to see the Catwoman vs. Zatanna fight you’ve been dreaming about since you hit puberty, this is the arc to read. 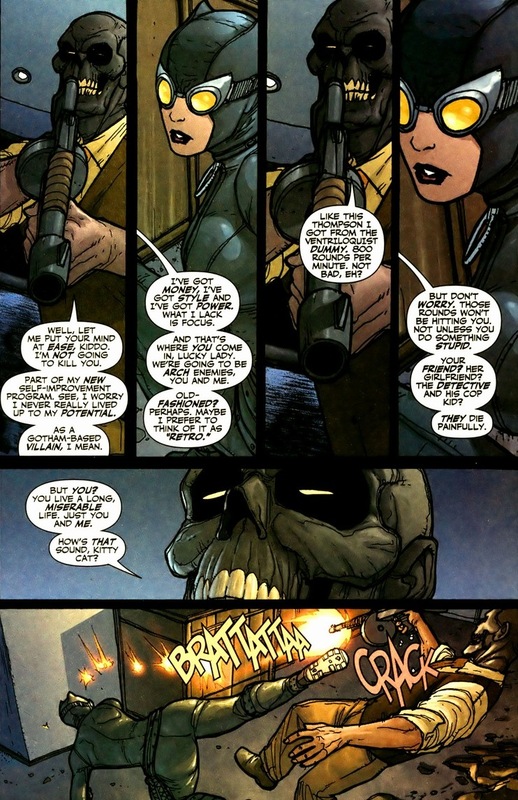 The reason I’m even mentioning the above paragraph is that while Catwoman confronts Batman about this, at the bottom of each page of their conversation, we get a little Black Mask gem. A genius way to show events that are going on simultaneously. But what happened, huh? 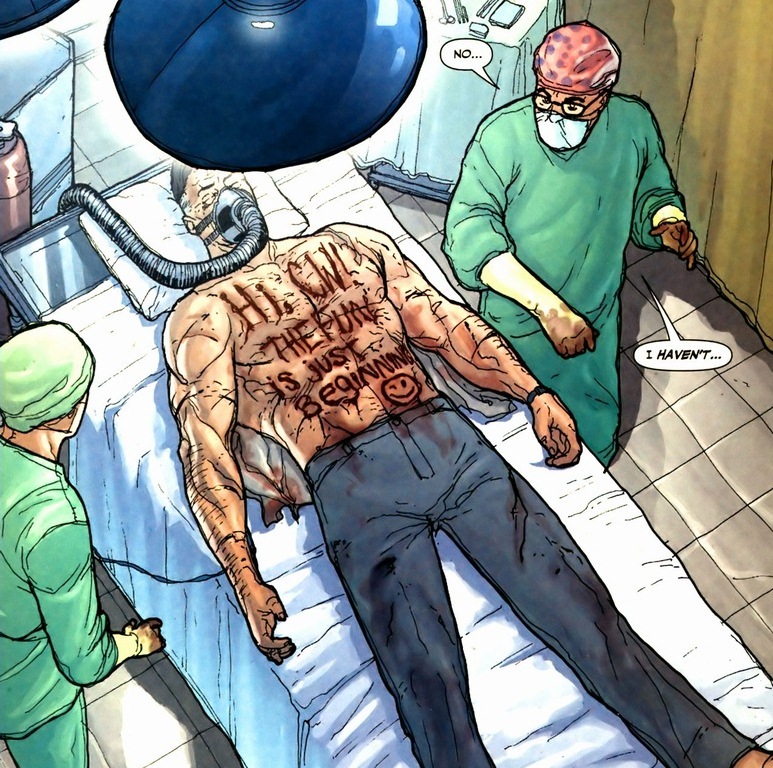 Who did Black Mask kidnap and how come none of say, Superman’s supporting cast gets brutally tortured like Catwoman’s? I’m just as surprised as you are at how many torture dungeons the Black Mask owns. In the superhero business, there’s an art to the process. The good guys survive through grace, style, and finesse. 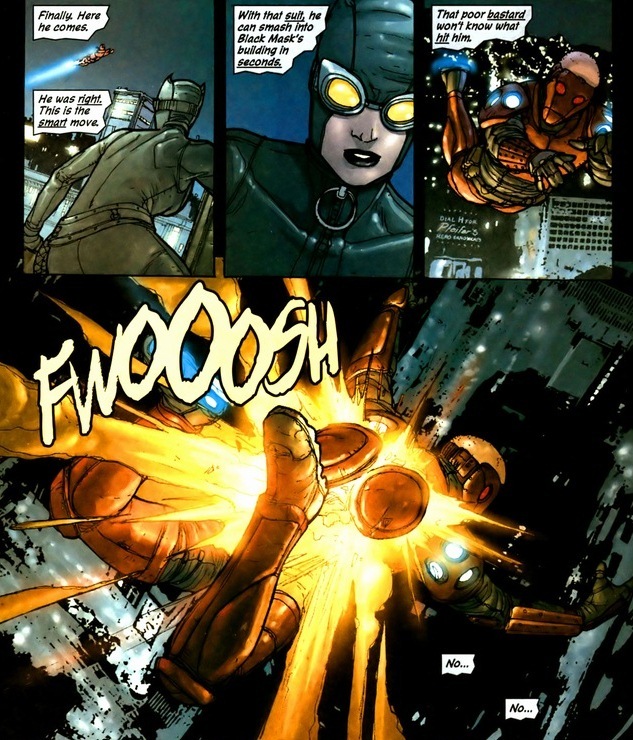 Brute force ain’t going to win a battle when you’re up against someone like the Joker or Poison Ivy. 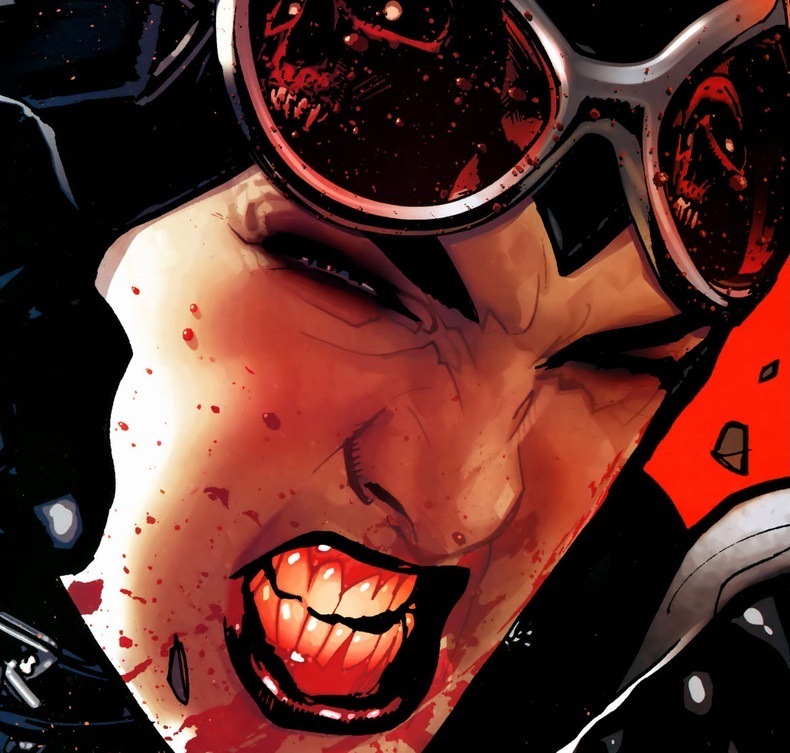 But when the clock’s ticking, when Selina’s sick of cowardly attempts to ruin her life, well, brute force will still get her pretty far. While motorcycles are pretty speedy nowadays, they aren’t faster than rocket boots. They’ll give mech suits to anyone nowadays. 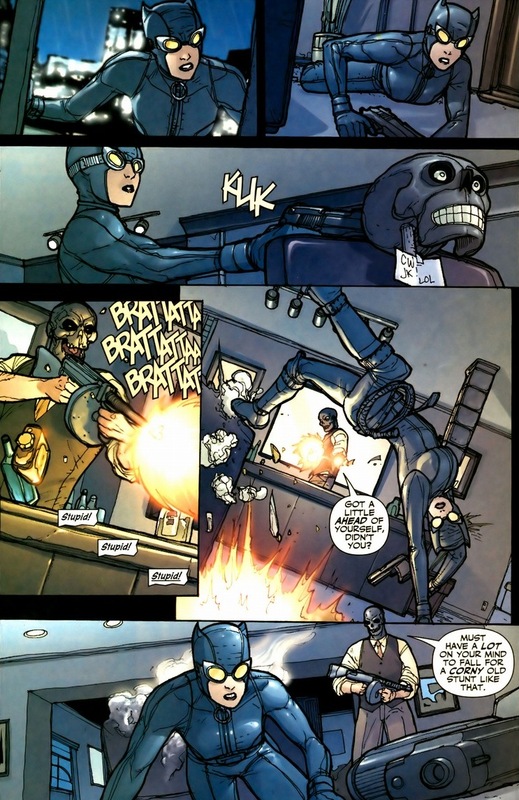 Want to see what Black Mask was working on? Heads up, he’s not an artist. That about sums up all the foreshadowing. 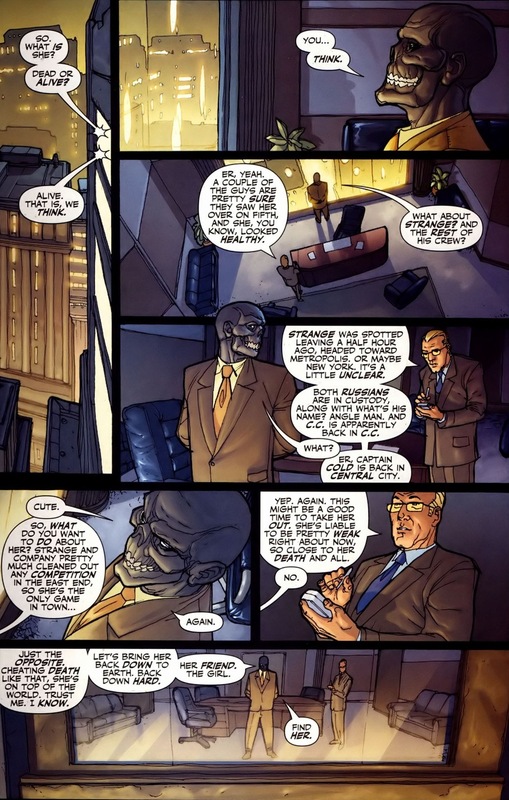 And sadly, Black Mask’s a man of high ambitions. Sure, maiming Catwoman’s friend with a Home Depot starter kit certainly showcases his potential for evil, but after last time’s four for four, he’s not about to just stop now at one. 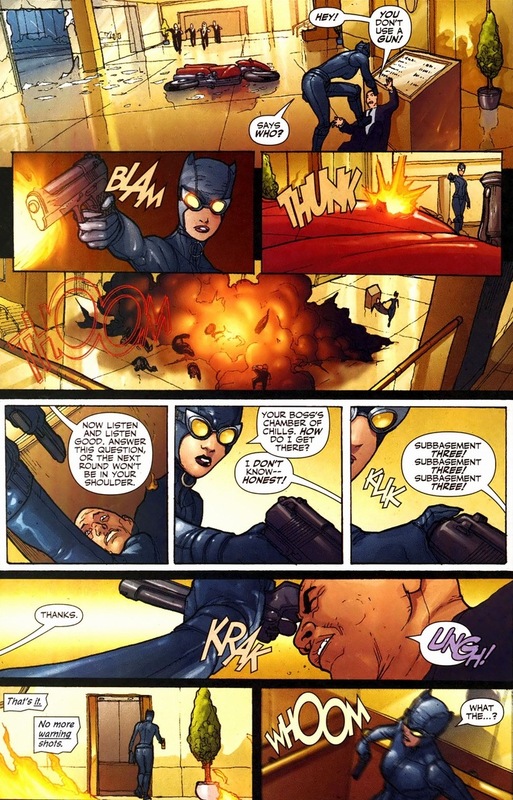 Catwoman, attempting to retaliate before the inevitable kidnap and mauling of Holly, launches her first plan into action. Predictably, it goes badly. Mech suits are weak to rocket launchers. At this point, her rage no longer qualifies as angry. No, it’s a calm, calculated coldness. Very much like the Punisher. Yes, the initial mobsters who killed Frank Castle’s family in the park received the brunt of his frustration. But his targets after that? He’s no less pissed, trust me, but it has transcended into a simple consequences-punishment system. Her turn now. 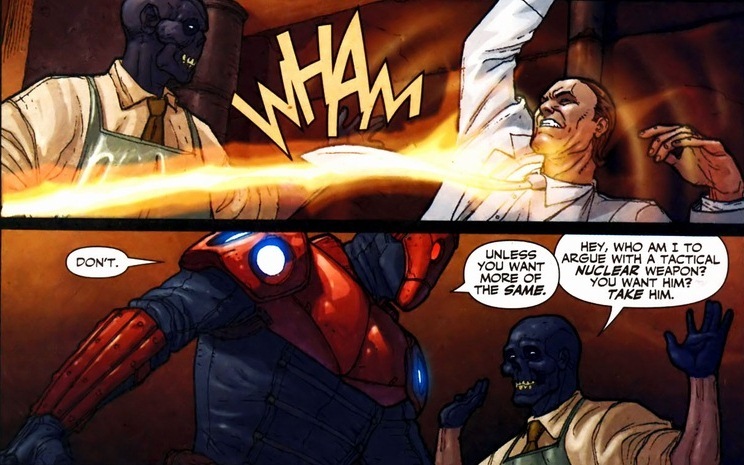 Especially since Black Mask obviously didn’t learn his lesson the first time. Thus begins the last pages of this arc and the confrontation between the two opposing forces. 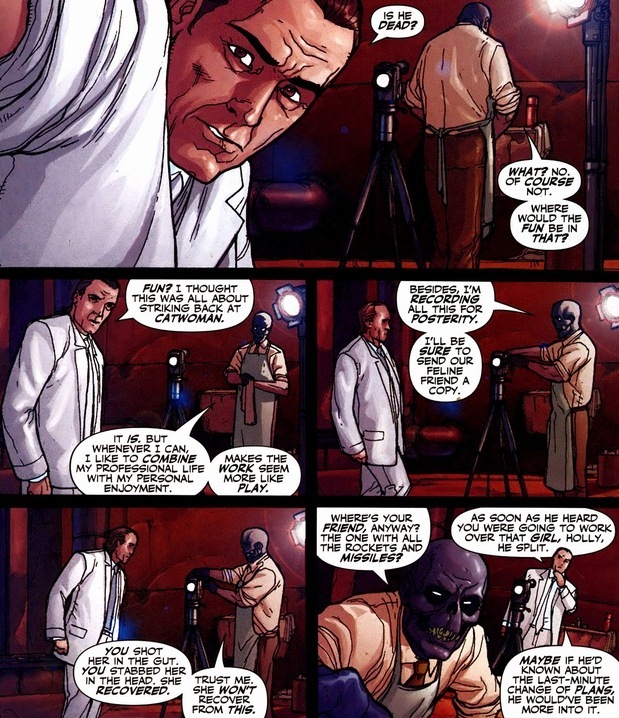 Can’t blame Black Mask for wanting an arch-nemesis, all the cool supervillains have one. Batman’s already taken. 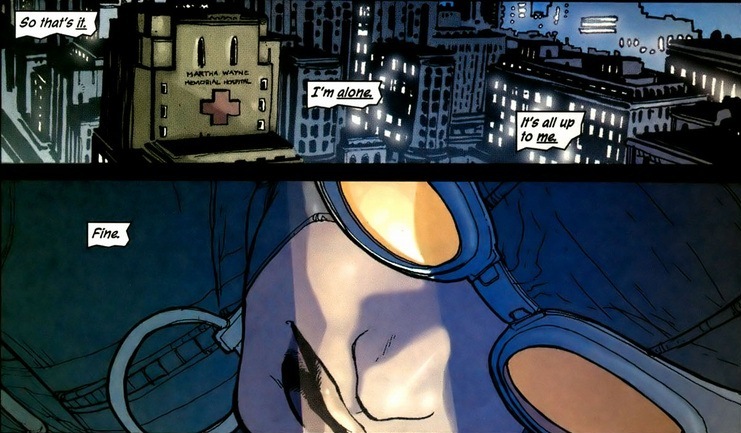 Nightwing lives in Blüdhaven. Robin or Batgirl are too sidekick-y. Truthfully, Catwoman’s a pretty solid choice. If he hadn’t attacked and scarred her friends and family. If he hadn’t pushed her back into that morally gray area she spent years clawing out from. Nope, gaining an arch-nemesis requires consent from both parties. No second chances. No redemption. 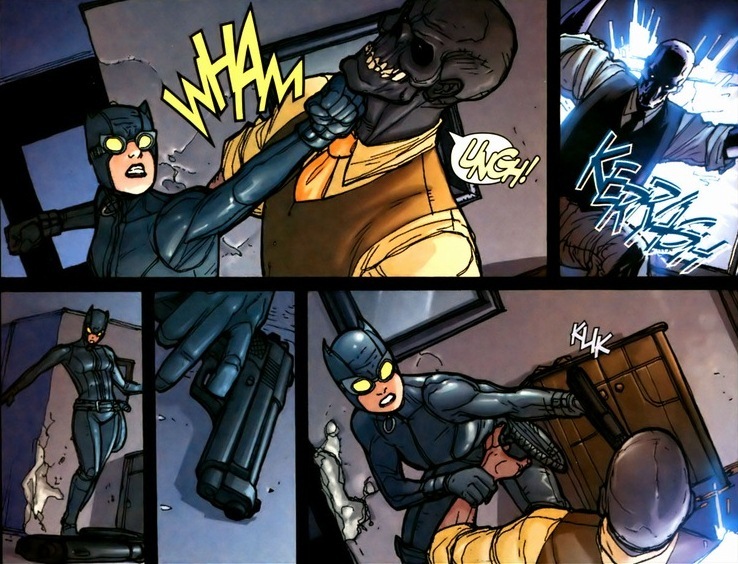 Catwoman is not Batman and unfortunately for him, Black Mask learned that lesson far too late. The end. Seriously. Roman Sionis, the original Black Mask, is dead. 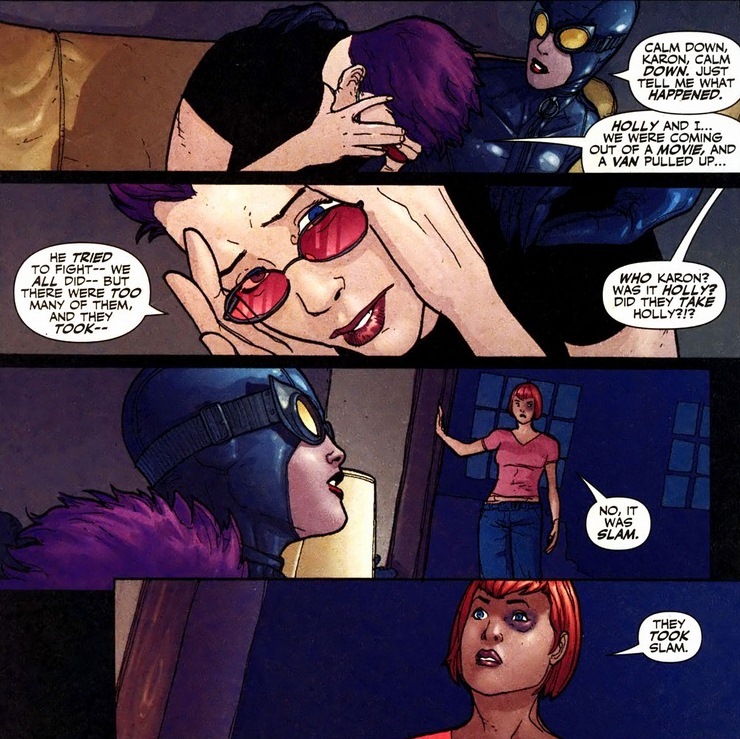 Want to know the aftermath, like the effects this has on the relationship with her peers and fellow superheroes? Well, too bad. I’m not being mean, I promise. This is the last issue before One Year Later, the jump in time that takes place among every DC series as a result of the major event Infinite Crisis. But at least this story has a definite ending. Just another normal day in Gotham City.